In case you still haven't set your Christmas breakfast menu, let me offer this delicious coffee cake! My favorite part is that you make it the night before and refrigerate it overnight before baking. In the morning you can stick it in the oven and hit snooze a couple more times or send your significant other down to stick it in while you stay asleep - I would, of course, never do that (hehehe). This recipe is delicious and you are a total rockstar for effortlessly serving a warm cake. I like to pair this with egg casserole which can also be made the night before AND they can be baked at the same time. WIN! Now you will actually need to accept an award for your fabulous, organized, awesome breakfast - I promise I'll keep the easiness a secret from your admirers... :) The awesome thing about this egg casserole is that you can customize it for your taste - you can add veggies, herbs, different meats, or various kinds of cheese - it is an all-time family favorite! You will thank your self for getting it done the night before and you will love the results! I serve with coffee and tea and with fruit juice and/or fruit salad. Since it's the holidays, sometimes we will sneak in some of our favorite(!) eggnog from the local creamery or a wonderful champagne cocktail or sparkling wine. Delish! In a mixing bowl, cream butter and sugar. Add vanilla. Add eggs, one at a time, beating well after each addition. Combine the flour, baking soda, cinnamon, nutmeg and salt; add to the creamed mixture alternately with yogurt. Pour into a greased 9x13 in. baking dish. In a small bowl, combine the brown sugar, pecans and cinnamon; sprinkle over coffee cake. Cover and refrigerate overnight. Remove from the refrigerator 30 minutes before baking. Bake, uncovered, at 350 degrees F for 35-40 minutes or until a toothpick inserted near the center comes out clean. Cool on a wire rack for a few minutes. 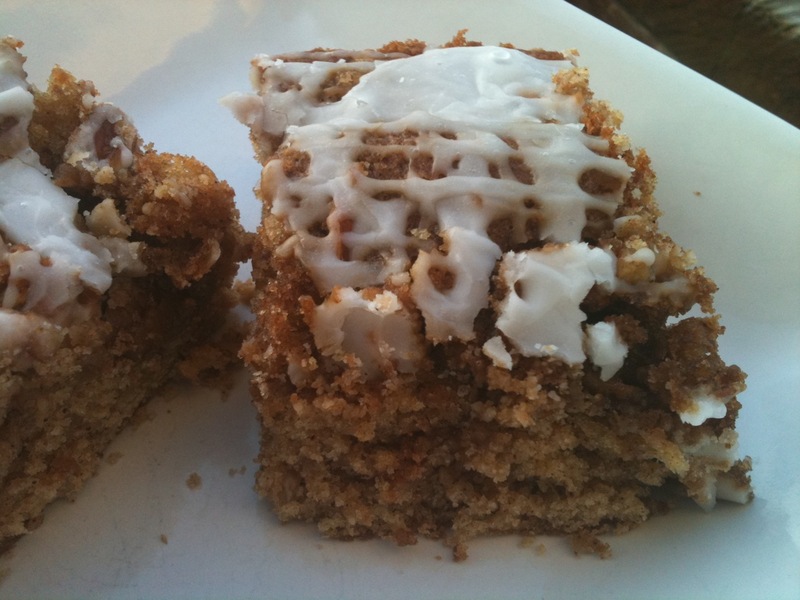 Combine confectioners' sugar and milk; drizzle over warm coffee cake.